Success at Food Show India! Galaxy Sivtek > News/Events > Success at Food Show India! Food Show India, A hub for food industry leaders organized 6th edition of the food show India in Nagpur. This was the biggest attraction for the food manufacturers and allied industries. The exhibition was held at Mihan Industrial Area Nagpur from 16-18 Dec 2018. Exhibitor at Food Show India was from the food processing industry catering grain, pulses, cereals, dairy & other food ingredient manufacturers. Galaxy Sivtek was one of the premium exhibitors at the expo and showcasing its sieving and filtering equipment to assist the almighty food industry. Galaxy Sivtek is known for its quality Sifters and Filters in the world. Designed with high technology and hygienic parameters gives you uninterrupted sieving experience. This 3-day exhibition was wonderful for us as well as for the visitors. Among the visitors, there were large industry leaders who were looking for sieving and filtering solutions for their bulk powder and granules. 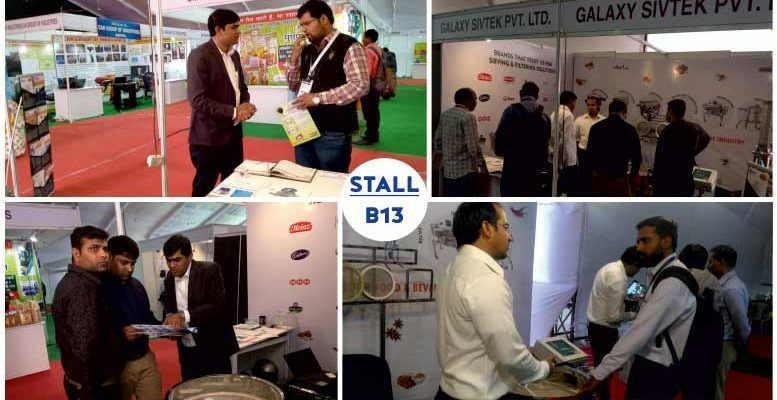 Galaxy Sivtek team was standing at the stall B-13 to assist industry leaders on their sieving related issues. Major issues they were facing because of low sieving quality. They wanted a robust solution which can screen the material without any breakdown. Galaxy Sivtek team suggested them a variety of sieving options which perfectly fits in their production line. Galaxy Sivtek showcased variety of sifters and filters at the expo including SIVTEK Sanitary Separator and Self Cleaning Filter. These machines were the center of attraction to the visitors as it was showing live demonstration. Live working of the Vibro Separator machine gave a chance to the people to see the sieving quality & power of the sifter. If you have missed the opportunity to see the live demo of the machine you can still schedule a meeting with our sieving experts. Contact us and we can suggest you the best product for your application.